CLICK HERE, enter your e-mail address (twice), and sign up! Each school day throughout the year, kids from Fulmore Middle School attend ASC’s Sunshine -4- After School Program between the hours of 4:00 and 6:00 p.m. when they are most vulnerable to negative influences, such as drugs and alcohol, gang activity and peer pressure. We’re looking for a few YMBL members to volunteer each day to come out and assist ASC staff. While there is a portion of the afternoon dedicated to homework, you’re not required to be a tutor. You’re there to hang out with the kids, be a positive role model, and to make it more fun. You’ll be amazed by the impact it has, not only on the kids, but on you. Let’s have fun. Encourage the kids with positive communication and pick someone up that appears to be having a rough day. Try not to go 100% when playing football, basketball or gaga ball with the kids. We want both the kids and the volunteers to have a fun, safe, and injury-free experience. For discipline issues and/or foul language, please contact Molly Kier as soon as possible. If you feel like you are at a point where activities have slowed down, ask the staff what they need help with. Do not engage the kids in any friendly hugs or contact, as we want to be as professional and liability-free as possible. High-fives and handshakes are acceptable if showing positive reinforcement and greeting one another. Volunteers should always be prepared to play outside for at least a few minutes (daily from 4:45-5:00, unless there is a special activity that day). Please arrive dressed in the proper attire or at least wearing tennis shoes. A: Volunteers should wear comfortable clothing that will allow for participation in a variety of indoor and outdoor activities (i.e. work clothes will likely not be suitable). Closed toe shoes are recommended. No bare midriffs, bra straps or short shorts. Keep in mind that some activities can get messy and volunteer attire should allow for full participation in all activities. Q: Do I need experience volunteering with kids? A: You certainly do not need to have significant experience working with kids. You just need to be willing to put yourself out there to help these kids have fun and hopefully make meaningful connections. Q: Are volunteers responsible for running the program? A: The volunteer role is simply to help support the staff and have fun with the kids while building relationships and providing positive role models along the way. The staff can run the program. Volunteers can just go with the flow of the program and jump in and participate however they are comfortable. Q: Who can I talk to about fitting in or how to go about my volunteering shift? A: Find Casey Jones, our volunteer coordinator. She is the go-to person for everything volunteering! She is excellent at organizing and delegating duties to individuals and groups of volunteers. Q: My first time volunteering with the program it was difficult to really interact and connect with the kids. Is that normal? A: Yes. That is a completely normal experience as a volunteer. At first you don’t know the program or the kids, and the kids do not know you. With each time you go the kids become more receptive. As you build relationships with them both you and the kids will get more out of your time. Q: Can I sign up only on the days that feature Math or Science or Engineering? A: Absolutely. We want the volunteers to be as comfortable as possible. And if that means that you enjoy Math the most and would add the most value as a Math helper, then great! Stick to that schedule! Q: How often do I have to commit to volunteering? A: There is no required commitment. Come as often as you are able. Ideally volunteers will come out on a regular basis as their schedule allows. Some volunteers are able to come a couple times a month and some even come weekly. Q: Do I have to be at S-4-AS the full two hours? A: No. Many of us find it difficult to get out of work before 4 or 4:30pm (i.e. due to meetings, traffic, or other unforeseen things). Being there for at least one hour helps the ASC staff tremendously and gets you familiar with the kids. However, if you do have to cancel please let someone know in advance (i.e. Casey and/or Molly). A simple email or a phone call would suffice. So please keep Casey and Molly’s info handy. Q: What do I do if a S-4-AS student is verbally or physically abusing me? A: While such a situation is rare, there are times where the students misbehave or “test” volunteers. Do not retaliate. Remove yourself from the situation and report the incident to Molly Kier as soon as possible. Q: Where is the Volunteering opportunity? A: Austin Sunshine Camps Zilker Lodge – located at 2225 Andrew Zilker Road 78746. Parking is available across from the camp driveway in the park. There is no parking available immediately in front of the lodge. All volunteers should park and then walk to the camp at their designated arrival time. Plan on 5 minutes to walk. 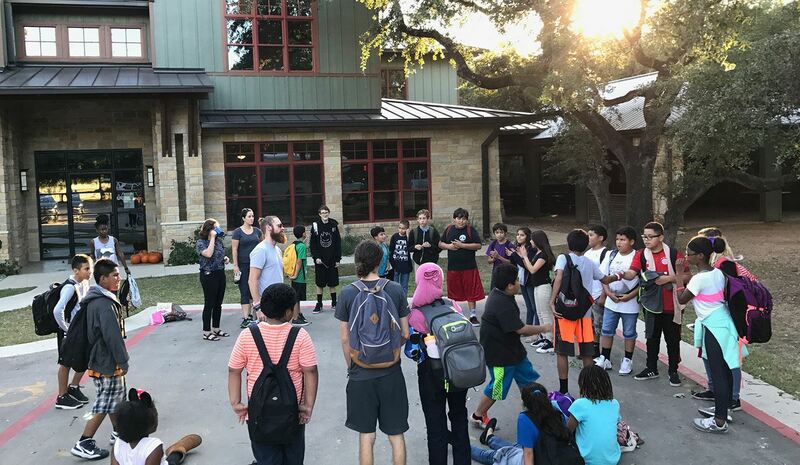 Q: Can I use the restrooms at the Zilker Lodge during the volunteering session? A: Of course! We’re not going to let you suffer! Please use the second floor bathrooms only. Q: What if I don’t know the answer to a math or science problem a child is working on during homework time? A: Totally fine to own it! Let them know you’re not sure and don’t want to lead them down the wrong path, and then ask a staff to help out! Q: What do I do during homework time if nobody asks for my help? A: Be present in the room and available. If you’re sitting with a child, ask them about their assignment/ how they came to an answer (this helps strike up a conversation & assists you in engagement).